Manufacturer & Supplier of a wide range of products which include Wheelchair Lifts such as Main Entrance Lifts, Commercial Building Lifts, Wheelchair Lifts for Hospitals and Lift for Shopping Complexes. We are one of the leading manufacturers of Main Entrance Lifts in Chennai, Hyderabad, Bangalore and Kerala. Our esteemed customers can avail from us superior quality Main Entrance Lifts as per their specific requirements. These lifts are manufactured using genuine quality raw material and components that are sourced from the trusted vendors of the market. 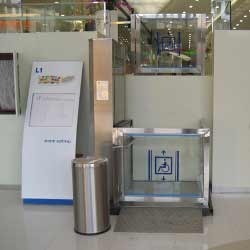 Our range of Main Entrance Lifts can easily carry minimum of 5 wheelchairs with an attendant. We are one of the leading manufacturers of Lift for Shopping Complexes in Chennai, Hyderabad, Bangalore and Kerala. We are engaged in offering a wide range of wheel chair lifts. Among these we offer Lift for Shopping Complexes. These lifts are useful for commercial building such as Shopping Complex, Theaters and hospitals where it is used for the accessibility of senior citizens and physically challenged people. 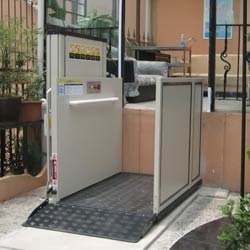 Looking for Wheelchair Lifts ?